TLF is the premier law firm in Southwest Colorado, and they provide sophisticated, strategic legal services in a wide array of practice areas. Get outstanding legal representation in real estate, water, mining, conservation easements, boundaries, litigation, contract disputes, property rights, land use, development, insurance, and criminal defense in all areas of Colorado. 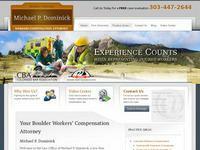 Meet workers compensation attorney Michael Dominick has fought for the rights of injured workers since 1973. Watch helpful videos about worker's compensation law. Contact Michael P. Dominick today for a free case evaluation, call 303-447-2644. He is dedicated to fighting for the rights of injured workers. Defending clients in Denver for over ten years, Flesch Law knows the policies in each county, and what the District Attorneys have authority to negotiate. They will be there at every step to give you honest counsel and to protect your interests. Put their expertise to work for you, call (303) 806-8886. Levine Segev, LLC is a full service law firm with expertise in residential and commercial real estate transactions, business and corporate transactions and planning, estate and trust planning, and immigration law. At Levine Segev, LLC, they focus on personalized, high quality, cost-effective representation. 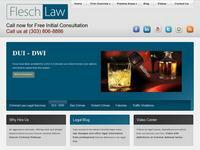 Their law offices serve local, regional, national and international clients. Arnold and Porter LLP's Denver office combines the firm's national and international practice with the regional contacts and local experience needed to represent clients in the Rocky Mountain region and elsewhere around the country and the world.